“Gouache on Newspaper” by Elizabeth Doran, 7×5 inches, 2015. Michael Ansara came late to writing after many years as an organizer, owning three businesses, and co-founding Mass Poetry. He is currently working on both a memoir and a first book of poems. Matthew Baker is the author of If You Find This, a Booklist Top Ten Debut of 2015 and an Edgar Award Nominee for 2016, and his stories have appeared in publications such as American Short Fiction, New England Review, One Story, Electric Literature, Conjunctions, and Best of the Net. He has an MFA from Vanderbilt University, where he was the founding editor of Nashville Review. His other projects include Early Work and Interview With An Artist. Ben Berman’s first book, Strange Borderlands, won the 2014 Peace Corps Award for Best Book of Poetry and was a finalist for the Massachusetts Book Awards. His second collection, Figuring in the Figure, is due out soon from Able Muse Press. He has received awards from the New England Poetry Club and fellowships from the Massachusetts Cultural Council and Somerville Arts Council. He teaches in the Boston area, where he lives with his wife and daughters. Sally Bliumis-Dunn’s poems have appeared in New Ohio Review, The Paris Review, Prairie Schooner, PLUME, Poetry London, The New York Times, PBS NewHour, Upstreet, The Writer’s Almanac, The Academy of American Poets’ Poem-a-Day, and Ted Kooser’s column, among others. Her books, Talking Underwater, and Second Skin, were published by Wind Publications in 2007 and 2009. Her chapbook, Galapagos Poems, was published by Kattywompus Press in 2016. Mary Buchinger is the author of two collections of poetry, Aerialist (2015) and Roomful of Sparrows (2008); she is co-President of the New England Poetry Club and Professor of English and Communication Studies at MCPHS University in Boston, Massachusetts. Monica Rose Burchfield, a native of northern Florida and of Cuban heritage, has a M.A. in poetry from Georgia State University. Her poems have been published in journals such as Mêlée, Rhino, Rattle, New South, Deep South Magazine, Terra Incognita, Dappled Things, The Healing Muse, Glass, Willow Springs, Literary Mama, and Jelly Bucket. She currently teaches creative writing at Georgia Highlands College in Marietta, where she resides with her husband and five children. Olivia Kate Cerrone is the author of The Hunger Saint (Bordighera Press, 2017). Her Pushcart Prize-nominated fiction won the 2016 Jack Dyer prize from the Crab Orchard Review. A member of the PEN American Center, she serves as an associate editor for CONSEQUENCE Magazine and as a creative writing workshop facilitator for Writers Without Margins, a nonprofit organization dedicated to marginalized voices. George David Clark’s first book, Reveille (Arkansas, 2015), won the Miller Williams Prize and his more recent work can be found in AGNI, The Cincinnati Review, The Gettysburg Review, Image, The New Criterion, The Southern Review, and elsewhere. He edits the journal 32 Poems. Jackie Craven is the author of Our Lives Became Unmanageable, a chapbook of flash fiction from Omnidawn. Her poetry has appeared in New Ohio Review, Nimrod, River Styx, Water~Stone Review, and other journals. She earned her Doctor of Arts in Writing from the University at Albany, New York. Tim Cresswell is a geographer and poet. His poems are widely published in North America and Europe. He is the author of two collections of poetry: Soil(2013) and Fence(2015), both published by Penned in the Margins (London). Gail DiMaggio watched her husband play jazz in a world where no artist ever gives up a day gig. And still, she has refused to become discouraged. Her work has appeared recently in Slipstream, Tishman Review, ELJ, White Stag, Blue Lyra Review, and Adanna’s Woman and Art Anthology. Elizabeth Doran is a painter and poet living in the Back Bay of Boston. She is currently the book buyer and events coordinator at the Grolier Poetry Book Shop in Cambridge. 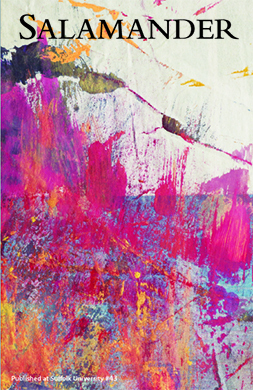 Two of her recent paintings were chosen by the Mass Poetry Festival for the Poetry on the T series. Valerie Duff-Strautmann’s reviews have appeared in The Boston Globe, PN Review, and The Critical Flame. She is the poetry editor of Salamander Magazine and works as a freelance writer. Erica X Eisen's works have or are due to appear in Little Star, Pleiades, The Atticus Review, Lumen, Buffalo Almanack, The Harvard Advocate, and the Nivalis 2015 Anthology. She is a recent graduate of Harvard, where she was a two-time recipient of the Cyrilly Abels Short Story Prize for best work of fiction by a female undergraduate. S.M. Ellis writes and lives in New York City. Simon Ó Faoláin (b.1973) was raised in Kerry and trained as an archaeologist. His debut collection, Anam Mhadra (Coiscéim, 2008) won both the Glen Dimplex Irish Award and the Eithne and Rupert Strong Award. His second collection, As Gaineamh, was published in 2011. Alan Feldman is the author of Immortality (University of Wisconsin Press, 2015) which was awarded the 2016 Massachusetts Book Award for poetry. Since 2008 he has offered free weekly drop-in poetry workshops at the Framingham public library and, in the summers, at the Wellfleet library. Sara Femenella received her MFA in poetry from Columbia University. Her poems have been published or are forthcoming in Pleiades, The New Orleans Review, Denver Quarterly and Dossier, among others. She lives in Los Angeles with her husband and son. Elizabeth Ferry is an anthropologist and teacher, and has done ethnographic fieldwork in Mexico, Colombia, and the United States. She is currently working on a book with her brother, the photographer Stephen Ferry, on small-scale gold mining in Colombia. She lives in Brookline with her husband, two sons, one dog, and one snake. Sara Fetherolf’s poems and essays have recently appeared in A Women’s Thing, The Raleigh Review, and The California Journal of Poetics, among others. She holds an MFA degree from Hunter College, and is currently a Dornsife Fellow in the PhD for Literature and Creative Writing at University of Southern California. George Fragopoulos is Assistant Professor of English at Queensborough Community College, CUNY. His poems have appeared in The Found Poetry Review, House Organ, and Momoware. He lives in Brooklyn. Stephen Gibson’s latest collection is Self-Portrait in a Door-Length Mirror, winner of the 2017 Miller Williams Poetry Prize from the University of Arkansas Press, selected by Billy Collins. Gibson’s previous six collections are The Garden of Earthly Delights Book of Ghazals (Texas Review Press, 2016), Rorschach Art Too (2014 Donald Justice Prize, Story Line Press, West Chester University), Paradise (Miller Williams finalist University of Arkansas Press, 2011), Frescoes (Lost Horse Press book prize, 2010), Masaccio’s Expulsion (MARGIE/IntuiT House book prize, 2008), and Rorschach Art (Red Hen Press, 2001). Rodney Gomez’s chapbooks are Mouth Filled with Night (Northwestern University Press, 2014), Spine (Newfound, 2015), and A Short Tablature of Loss(Seven Kitchens Press, forthcoming). His work has been awarded the Drinking Gourd Chapbook Prize, the Gloria Anzaldúa Poetry Prize, and the Rane Arroyo Prize. His poetry has appeared in various journals including Denver Quarterly, Barrow Street, Blackbird, Pleiades, Diode, Puerto del Sol, Salt Hill, Drunken Boat, and RHINO, where it won the Editors’ Prize. Kelle Groom is the author of four poetry collections: Spill (forthcoming), Five Kingdoms, Luckily, Underwater City, and a memoir, I Wore the Ocean in the Shape of a Girl. Her poems appear in American Poetry Review, Best American Poetry, The New Yorker, New York Times, Ploughshares, and Poetry. Robert Hirschfield is a New York-based poet and reviewer of books of poetry. His poems have been published in Descant, Tablet, and European Judaism. His reviews appear in Jewish Review of Books, Sojourners, and The Jerusalem Report. Natalie Homer is an MFA candidate at West Virginia University. Her poetry has been published or is forthcoming in Ruminate, The Lascaux Review, Bellevue Literary Review, and others. Chloe Honum is the author of The Tulip-Flame, which was a 2015 PEN Center USA Literary Awards finalist. Her poems have appeared in The Paris Review, Orion, The Southern Review, and elsewhere. Raised in Auckland, New Zealand, she currently teaches at Baylor University. Vedran Husić was born in Bosnia and Herzegovina and raised in Germany and the United States. A recipient of a 2016 Prose Fellowship from the National Endowment for the Arts, he has fiction published in Ecotone, The Gettysburg Review, Electric Literature's Recommended Reading, and elsewhere. This is his first poetry publication. Cory Hutchinson-Reuss grew up in Arkansas, holds a PhD in English from the University of Iowa, and currently lives in Iowa City with her family. Her poems have appeared in The Pinch, Drunken Boat, Four Way Review, American Literary Review, and elsewhere. Miron C. Izakson is the prize-winning author of sixteen volumes of Hebrew poetry: among them, A Different Source (Toby Press, translated by Betsy Rosenberg) and the novel Nathan and His Wives (Syracuse University Press, translated by Betsey Rosenberg). Izakson teaches at Bar Ilan University and is a regular contributor to the literary section of the Ha'aretz newspaper. Kasey Jueds is the author of Keeper (University of Pittsburgh Press, 2013), winner of the Agnes Lynch Starrett Award. Recent poems have appeared in American Poetry Review, Beloit Poetry Journal, and Crazyhorse, and her reviews have been published in Salamander and Jacket2. She lives in Philadelphia. George Kalogeris is the author of a book of paired poems in translation, Dialogos, and of a book of poems based on the notebooks of Albert Camus, Camus: Carnets. His poems and translations were anthologized in Joining Music with Reason, chosen by Christopher Ricks. He teaches English Literature and Classics in Translation at Suffolk University. Kjerstin Anne Kauffman holds an MFA from Johns Hopkins University. Her recent poems appear in such venues as Gulf Coast, Gingerbread House, and 32 Poems, and her essays in The Cresset, Literary Matters (New Series), and The American Poetry Review. She is currently leading a poetry workshop at Hillsdale College. Ellen Kaufman has published poems recently in Upstreet and The Yale Review. Her book, House Music, came out from Able Muse Press in 2014. Becky Kennedy is a linguist and a college professor; her poems have appeared in many journals and in a chapbook published by Finishing Line Press. Her work has been nominated for a Pushcart Prize and has appeared on Verse Daily. Jacqueline Kolosov's poetry and prose have recently appeared in Boulevard, The Southern Review, The Sewanee Review, and Prairie Schooner. Her third poetry collection is Memory of Blue (Salmon, 2014). She coedited Family Resemblance: An Anthology and Exploration of 8 Hybrid Literary Genres which won Foreword's Gold Medal in Writing (Rose Metal, 2015). She directs the Creative Writing Program at Texas Tech, where she is Professor of English. A native of Chicago, she lives with her family in West Texas. Sonya Larson's short fiction and nonfiction have appeared in the American Literary Review, American Short Fiction, Poets & Writers, Audible.com, West Branch, Del Sol Review, The Red Mountain Review, and The Hub. She has received honors and fellowships from Best American Short Stories 2015, the Vermont Studio Center, the University of Wisconsin-Madison, the St. Botolph Club Foundation, and the Bread Loaf Writers' Conference, among others. She directs GrubStreet's Muse and the Marketplace conference, and studies fiction in the MFA Program for Writers at Warren Wilson College. Chinese poet, fiction writer, film director, and scriptwriter Yin Lichuan ( 尹丽川 ) rose to literary notoriety as one of the founders — and the most prominent member — of the “Lower Body” Movement based in Beijing during the early 2000s. She lives in Beijing. Maja Lukic’s work has appeared or is forthcoming in Colorado Review, Western Humanities Review, Sugar House Review, Vinyl, The Moth, Prelude, and other publications. Douglas Luman is the Book Reviews Editor for the Found Poetry Review, Head Researcher of appliedpoetics.org, Art Director at Stillhouse Press, Poetry Editor for Phoebe, a book designer, and digital human. T.J. McLemore’s poems have appeared or are forthcoming in Prairie Schooner, Crazyhorse,Massachusetts Review, and others, and he won the 2016 Richard Peterson Poetry Prize at Crab Orchard Review. He lives in Fort Worth, Texas, and teaches at TCU. Owen McLeod's poems recently appear or are forthcoming in New England Review, The Missouri Review, FIELD, The Yale Review, Columbia Poetry Review, and elsewhere. He is a potter, an associate professor of philosophy at Lafayette College, and lives in eastern Pennsylvania. Jean Monahan's published books of poetry include Hands, chosen by Donald Hall to win the Anhinga Prize, Believe It or Not and Mauled Illusionist, published by Orchises Press. Her poems have appeared in Poetry, The New Republic, and the Atlantic Monthly, as well as numerous other publications. She is at work on a new collection, Search Party. J.L. Montavon was born and raised in Denver and now lives in San Francisco. This is his first published story. Elisabeth Murawski is the author of Zorba’s Daughter, which won the May Swenson Poetry Award, Moon and Mercury, and two chapbooks. Her publications include The Yale Review, Arts & Letters, and FIELD, among others. A native of Chicago, Sandburg’s “city of the big shoulders,” she currently resides in Alexandria, VA.
Yehoshua November’s first poetry collection, God’s Optimism, was a finalist for the LA Times Book Prize. His second collection, Two Worlds Exist, was recently released by Orison Books. November’s poems have appeared in The New York Times, Prairie Schooner, The Sun, Virginia Quarterly Review, and on NPR. Born in 1993, Nebeolisa Okwudili is a Nigerian writer who has his works forthcoming or featured in Cincinnati Review, Commonwealth Writers, Ambit Magazine, Word Riot, and elsewhere. He won the joint 2nd place in the Okot P Bitek Prize for Poetry in Translation and was a finalist for the 2016 Sillerman First Book Prize for African Poets. Derry O'Sullivan (b.1944), a former Catholic priest, teaches at the Sorbonne, the Institut Catholique and the Institut Supèrieur d’Eléctronique de Paris. His poetry collections include Cá bhfuil do Iudás? and An Lá go dTáinig Siad. Ryan Paradiso is a poet living in West Texas. Jill Pearlman is a poet and fiction writer based in Providence, RI. A previous poem appeared in Salamander #40. She writes a blog about art, aesthetics and cultural politics. Daniel Evans Pritchard is a poet, translator, and essayist living in Greater Boston. He is the founding editor of The Critical Flame and serves on the board at Salamander. His writing can be found at Harvard Review online, Drunken Boat, Slush Pile, Prodigal, The Quarterly Conversation, and elsewhere. Philip Raisor has published memoir, scholarly articles, an edited collection of essays on W. D. Snodgrass, and poetry: most recently, Swimming in the Shallow End (2013) and Headhunting and Other Sports Poems (2014). Hoosiers the Poems won the 2013 Palooka Press chapbook prize. His work has appeared in Southern Review, Sewanee Review, Prairie Schooner, Poetry East, Ascent, The Writer’s Chronicle, and elsewhere. He lives in Virginia Beach, Virginia. Betsy Rosenberg's book of selected poems, A Future More Vivid, was published by Sheep Meadow Press in 2014. Lisa Rosinsky is the 2016-2017 Associates of the Boston Public Library Writer-in-Residence. Her poetry appears in Measure, Prairie Schooner, Hunger Mountain, Iron Horse Literary Review, and various other journals. Her first novel, Inevitable & Only, will be published by Boyds Mills Press in Fall 2017. Jackson Sabbagh is an MFA candidate in poetry at the University of Florida. They won the Academy of American Poets College Prize at Sarah Lawrence College. Their poems have appeared in journals such as Word Riot and RUST + MOTH, which nominated them for a Pushcart Prize. Austin Sanchez-Moran received his MFA in Poetry from George Mason University. His poetry and short fiction has been published in Denver Quarterly, The Laurel Review, and The Catamaran Literary Journal, among others. He will also be included in this year's Best New Poets of the Midwest. Aimée Sands is a MacDowell Colony Fellow and the author of The Green-go Turn of Telling (Salmon Poetry, 2012.) Aimée’s work has appeared or is forthcoming in Missouri Review Online, FIELD, Poet Lore, Beloit Poetry Journal, and other literary journals. She holds an MFA from Bennington College and is co-director of the Brookline Poetry Series, where she also leads poetry workshops and master classes. She is the producer/director of the independent documentary What Makes Me White? and teaches at Bentley University. J.D. Scrimgeour’s most recent poetry collection, Lifting the Turtle (Turning Point), will be published in the Fall of 2017. He’s the author of the poetry collections, The Last Miles and Territories, as well as two nonfiction books, including Themes For English B: A Professor’s Education In & Out of Class, which won the AWP Award for Nonfiction. He also has a CD of music and poetry, Ogunquit & Other Works (MSR Classics). Tara Skurtu is the recipient of a 2015-17 extended Fulbright in Romania, a Robert Pinsky Global Fellowship, and two Academy of American Poets prizes. Her recent poems have appeared in The Kenyon Review, Poetry Review, and Tahoma Literary Review. Tara’s debut poetry collection, The Amoeba Game, is forthcoming by Eyewear Publishing in 2017. Fiona Sze-Lorrain’s third poetry collection, The Ruined Elegance (Princeton, 2016) is a finalist for the Los Angeles Times Book Award. Her latest translation, Yi Lu’s Sea Summit (Milkweed, 2016) is a finalist for the Best Translated Book Award. She lives in France. John Allen Taylor’s poems are published in Booth, Nashville Review, Faultline, WILDNESS, Muzzle, and other places. He currently lives in Boston, where he serves as Redivider's poetry editor and Ploughshares’s senior poetry reader. He grows vegetables and brews kombucha. Andrea Uptmor's work has appeared in McSweeney's, Midwestern Gothic, Blue Lyra Review, and elsewhere. She lives in Minnesota. Derek JG Williams puts words into rows both long and short. He's a graduate of the MFA program at UMass Boston and a 2016 Blacksmith House Emerging Writer. His poems are published or forthcoming in Plume, Best New Poets, Vinyl, Forklift Ohio, Prairie Schooner, and New Ohio Review, among others. Derek currently lives in Arizona. Ashley Wong grew up in New Hampshire. Her poetry has appeared in Prairie Schooner, Crab Orchard Review, and Fugue, among others. She received an MFA from Boston University where she was a Robert Pinsky Global Fellow to Timor-Leste. She currently teaches English in the greater Boston area. An award-winning visual artist and poet from Athens, Maria Zervos lives and works in Boston, Amsterdam, and Athens, where she is represented by the Ileana Tounta Contemporary Art Center. Distinct for its vivid poetry and its allusions to history and myth, her work investigates the conflation of poetry and image, nature and culture, and aspires to social criticism.